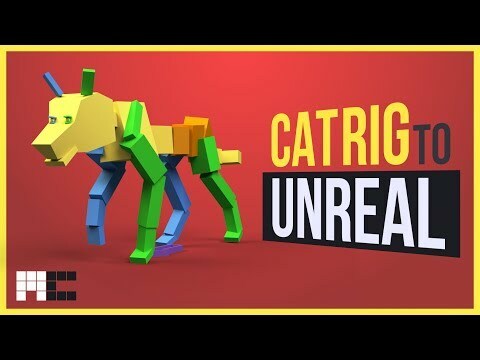 another exciting topic, and that is, how to export and import CAT rig and animations into the Unreal engine. Link is in the top right corner or below the video if you want to watch that first. We explained how to set up the root bone in CAT and why do we need it. In this video we will use exactly the same rig. But first, let's think about what we actually need to export. We can separate files into two categories. The Model contains skeleton in it's default pose and mesh of the model as well. If you have just one mesh variation for the model you will have just one file in this category. But you can have more of course. For example if this wolf had a female version. Or if the different animal had the same skeleton as this. Like a dog maybe or something like that. But in our case, it's just one file. The Animation category however, will contain a file for each animation we want to have. So this wolf could have tens, or even hundreds of animation files for just one model file. of how to sort them and keep them organized. Ok, so first, let's export the Model. Select all the bones and all the meshes as well. In our case it's just this one, but you have multiple separated objects that create a character. It doesn't matter, just remember to select them all. Also don't select CAT IK platforms, nor the CAT triangle. These are just helpers and are not part of the skeleton we need in game. Now this is an optional step, but it's useful to do. Set with everything we have selected at the moment. to Export and Export Selected. Create a folder for exports and name the file wolf_model. In these settings, you usually don't need to change much. groups, because we want to keep the model with this polygonal look. If we didn't select it, the model would be smoothed out in Unreal. Hit ok and it's done. Now let's create another Selection Set for animation. But don't forget the root bone. Save the selection as anim_export. Save this whole file as Wolf_model. This will be our base, default file of this character. I usually don't keep any animations in here, but maybe you can leave skin test animations for example. They might be useful when you will want to change something in the model later on. When you will want to create new animations, make them in this file. Let's say you have animating this idle. It's actually the animation from tutorial we did two videos ago. Link is below the video and in top right corner as well if you want to watch how to do this. Ok, so let's disable this idle part of the animation and export just the default stand with breathing. You can see I have written this .60f into the name. I don't have to remember it when I want to reexport it again later. we of course have the Selection Sets here. Let's select anim_export and Export Selected to Wolf_Stand. For animations, make sure you have Animation selected as well as Bake Animation. Now let's export the second animation which is the stand idle with head rotating. Change timeline to 180 and do the whole process again. You have to do this for every single animation you want to export. Also, as you can see, you can of course keep more animations inside one .max file. Ok so we have everything exported, let's import it into the Unreal Engine. I am not going to go into much details here. I will just show how to import the animations and show that they actually work without any problems. so the engine can create a skeleton for our character. Hit Import and select the model. Here we don't need to change anything, I just changed the rotation because I wanted to. Ok so, the model is imported and we can take a look at it. It also has our CAT skeleton as you can see. And with animations it's basically the same process. I have also added run and start run animations, just to present that root motion is working fine as well. So here, just select the newly created wolf skeleton. As you can see everything works fine. it's fixed on place, as it should be. And that you don't have to be afraid of it. For some reason CAT has a reputation that it is buggy and that nothing works there. However in my own experiences over the years, I think exactly the opposite actually. and solve the issues I discussed in previous video, you are basically separated from CAT. Motionbuilder or whatever other animation system. For the game engine, it's the same. It was a topic I was asked quite a lot about. How to get CAT into Unreal. And as always, share, like and leave some comments. I am Miloš Černý and Thank You for watching.